So, it all comes down to one decision: a deck, or a screened porch? The two options can seem overwhelmingly positive or negative, depending on your personal view. So, it all comes down to one decision: a deck, or a screened porch? The two options can seem overwhelmingly positive or negative, depending on your personal view. However, if you’re struggling to choose, it’s time to weigh your decision based on your own needs and wants. Personal circumstance is a huge factor, because every family has different uses for their backyard. So, which will you choose? For the most part, decks are larger than screened porches. So, if you’re short on space in your yard, you should consider a screened porch. Also, it’s common practice to build screened porches on the ground floor. If you’re looking for something elevated, a deck is probably what you’re looking for. Do you have pets? Children? Consider a deck. Screened porches are great, but they offer very little in terms of easily accessing your yard. If a dog needs to be let outside, you’ll have to follow them out two separate doors. A deck can provide easy access for kids so they can play in the yard without having to worry about any extra steps or damage. If you’re looking to use this outdoor space all year, you might want to consider getting a screened porch, as it’s much easier to use in this respect. Even with copious amounts of snow, it provides a place to spend your time outdoors. And, when outfitted with fans, it can be a wonderfully shaded area to relax in during the summer. A deck can also be used year round, but if you don’t frequently use your outdoor space, then a deck is your best bet. 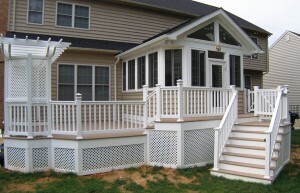 Mid-Atlantic Deck & Fence can install your screened porch or deck today!